Replica prop makers eFX has just announced the release of three new collectibles from the world of Marvel’s The Avengers. First up is a set of replica posters from Captain America: The First Avenger. The posters were made using the same digital files that were used to create the posters that were seen on-screen. They measure 22 x 36 and are printed on archival paper. The colors are rich and they have blemishes and edge wear built in so they look as if they were created in the 1940’s. 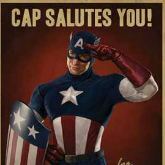 There are three styles; Captain American wants you to buy war bonds; Cap salutes you; and a Captain America tour poster with a cancelled sticker across the front. The posters cost $20 each. For a limited time eFXCollectibles is offering free shipping to US addresses. California residents must pay sales tax. On October 16, eFX will begin selling Captain America vintage trading card replicas. The set comes with both the clean cards from the 1940’s and the blood streaked version seen in the Marvel’s The Avengers movie. Finally, on October 9, eFX will start taking pre-orders for their line of replica helmets from The Avengers. The first item will be Thor’s winged helmet and hammer. Other items in the line include Iron Man’s helmet and Captain America’s helmet and shield.